The first thing to listen for, if a car will not start, is the flywheel engaging. Image from Wikimedia Commons. There is nothing like the desperation that comes with a car that will not start. It causes some to panic and others become so angry that The Incredible Hulk would hide. However, when it comes to an automotive problem, the first thing to do is always stay calm. There is a science to how cars work, and a little knowledge can help diagnose why the darn thing won’t turn over. The ignition system comprises two major processes. First, the starter motor engages the flywheel that operates the cam shaft. This gets the pistons working. Second, fuel is injected into the engine and is ignited by the spark plugs, which begins combustion and the piston cycle. When the process does not work, panic, anger or desperation can set in. Profanities are often hurled at the insolent vehicle. However, there is an easy way to figure out what is going on. 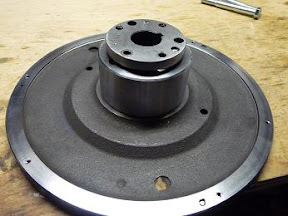 Flywheel – Listen for the “click” of the flywheel engaging. No click means the flywheel is the problem. Starter – If the flywheel isn’t engaging, but the starter works, there will be a series of clicks from the starter. Fuel pump – there should be a subtle “whirr” of the fuel pump. Some cars have fuel pumps inside the tank, and the fuel it sits in is also the coolant. Running the car out of gas can cause the pump to burn out. If the battery has failed, it will be obvious as the vehicle will be completely dead. However, if all these sounds are heard and the battery is charged, that is when a real problem may exist. Sometimes it is a dead wire, the battery terminals need cleaning or the spark plugs or plug wires are malfunctioning. That said, if a vehicle is still not starting despite these usual suspects, consult a qualified mechanic.